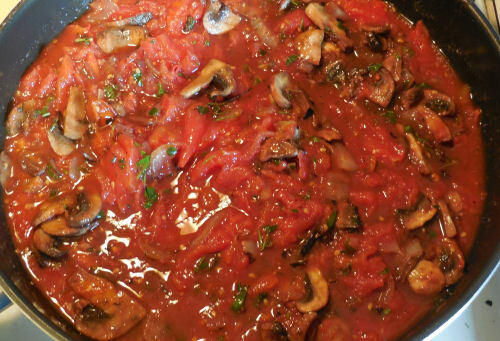 I recently made a batch of home made mushroom marinara sauce and wanted to use it for a great tasting recipe. My husband loves spicy sausages, so I combined them with a home made sauce to make this Italian Sausages Recipe. 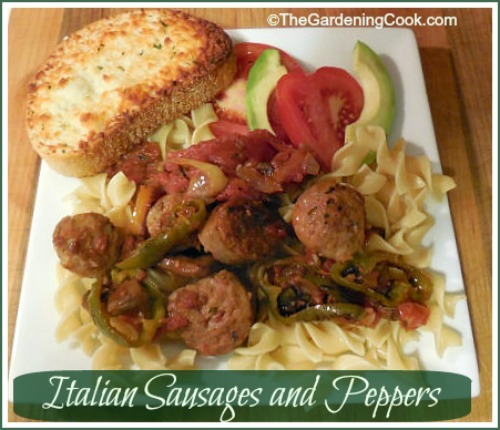 I love Italian Sausages and peppers recipes. The combination seems just perfect for each other and they are also very easy to prepare. 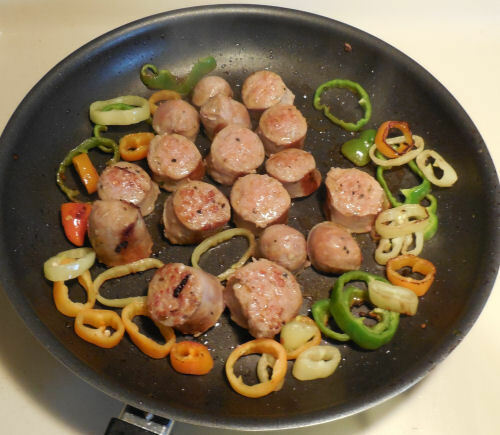 Try this one pot Italian sausage and Peppers meal for another tasty way to prepare them. For today’s recipe, we’ll be using a home made marinara sauce for extra taste. I made my marinara sauce ahead of time. I cook it often and freeze it and then use it for quick meals like this another time. One the sauce is made, the rest of the dish could not be easier. While the marinara sauce is simmering, start to prepare the other ingredients. Core and slice peppers and onions. 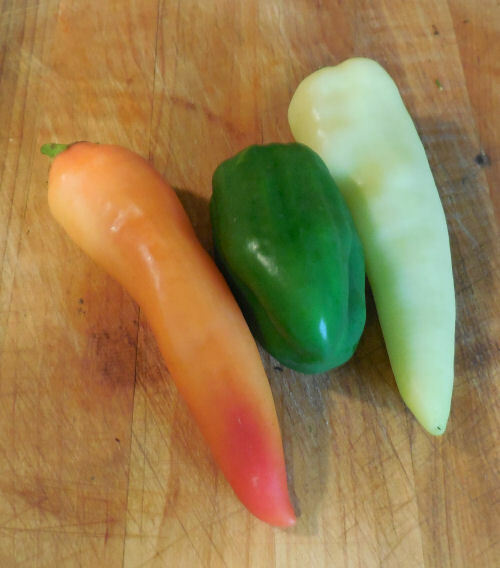 I chose a red and yellow banana pepper, and a normal green pepper from my garden. Cook them gently until the vegetables start to soften and caramelize. Add the sausages and cook until they are browned. Place 1 tbsp of olive oil in a skillet and cook the peppers and Italian sausages over a medium heat until the sausage browns. Remove the sausages and slice into pieces. Add back to the pan and cook until the sausage is thoroughly cooked through. Egg noodles made a great base for the dish. Boil the noodles for 7 minutes. While the noodles are cooking, add the sausage and peppers to the homemade mushroom marinara sauce. Stir to combine. 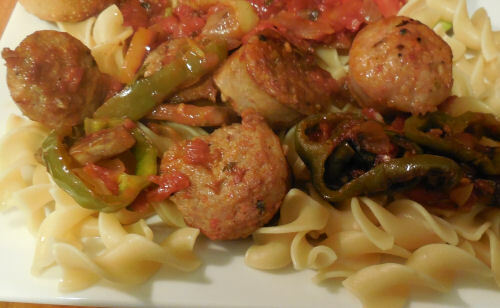 Serve the sausages and peppers with the sauce over the cooked egg noodles. Enjoy! 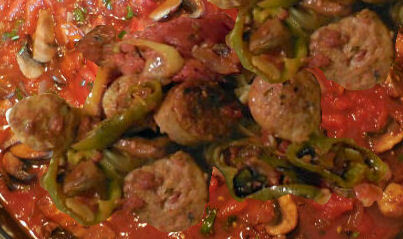 Sweet Italian sausages get a new look by adding a home made marinara sauce to the recipe. 3 medium peppers, sliced. I used banana peppers and green peppers. Heat the oil in a skillet over medium high heat. Add the sliced peppers and onions in a frying pan and cook until the vegetables are nicely browned and caramelized. Add the whole sausages and cook until the sausage browns. 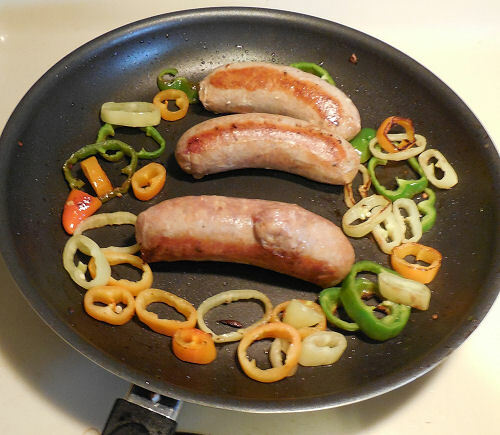 Remove the sausage, slice into smaller pieces and return to the pan to finish cooking. Add the sausage and peppers to the home made marinara sauce and simmer gently while the noodles cook. 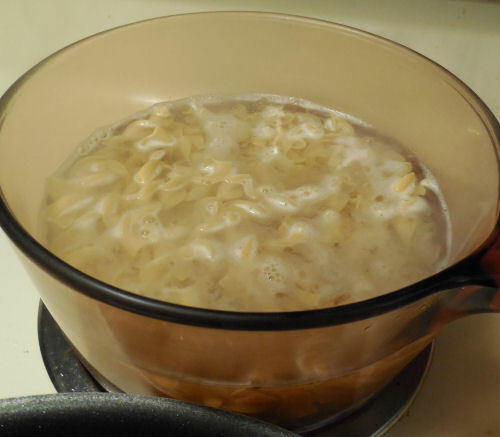 Heat the egg noodles in boiling salted water for 7 minutes until al dente. Spoon the sausage mixture over the noodles and serve with salad and garlic toast.